Traditionally the last sap run of the sugaring season is called the Frog Run because that’s when spring peepers appear. Boiled down, the sap produces a dark syrup without much commercial value. But long ago, that late season run was key to a beverage that offered some cool relief during the high summer days of haying. "Old man with the sugarin’ through / What can you be lookin’ for here / Well, son we’re gonna start brewin’ / Sap beer!" By then you would have been hard pressed to find any of it to drink. Homemade sap beer had been replaced by a quick trip to the convenience store to pick up a few bottles of commercial beer to extinguish a thirst stoked by a day of haying. Sap beer recalls a time when there was no convenience store, or if you go far enough back, no car to drive to one. In a recent interview former Agriculture Secretary Roger Albee told the Vermont Folklife Center how his father and grandfather brewed a barrel of sap beer in the cellar in the spring, then dipped into it after a long, hot day of summer farm work. "I was just a teenager," Albe recalled. "My father said, ‘well, its time to bring some of that sap beer out of the cellar’. I remember it was very refreshing, it caused a great change in the head, so to speak." Unlike beverages flavored with maple syrup, sap beer is made by boiling the cloudy end of season sap down only about halfway to where it’s syrup. In a 1992 interview with the Folklife Center, the late Edgar Dodge described how the beer was made on the Tunbridge Farm where he grew up. "You’d take the last run of the sugaring operation, get down to where you can taste the leaves in it, that sort of thing," Dodge said. Hops, yeast, a little sugar or maybe some raisins were added to the sap. According to Dodge, it was all put up in a barrel until a few months later. "It would be fit to drink about the first of haying, which in those days was the fourth of July. You’d start haying about the fourth of July," he said. There’s always a little guesswork and mystery involved in beer-making, and that applied in spades to sap beer. Dodge said you couldn’t be sure until you took a pour if the final product would drinkable or, "Junk! Stringy! Nobody could drink it, cut it off with a pair of shears, that sort of thing." But when it worked what came out of the barrel was a potent brew. "You could have sap beer that was just as clear as any ale you ever saw," Dodge recalled. "I don’t think the man ever lived that could drink two eight ounce glasses and walk ten minutes later. I don’t believe so. So, that was sap beer. I doubt if there’s a barrel of sap beer in the state of Vermont today." But there’s a spark of renewed interest in the old refreshment, thanks to a couple of Vermont brewers. Matt Cohen of Fiddlehead Brewing Company in Shelburne is picking up where the farmers of the past left off, although his approach is a little higher tech than the traditional sap beer brewing process. 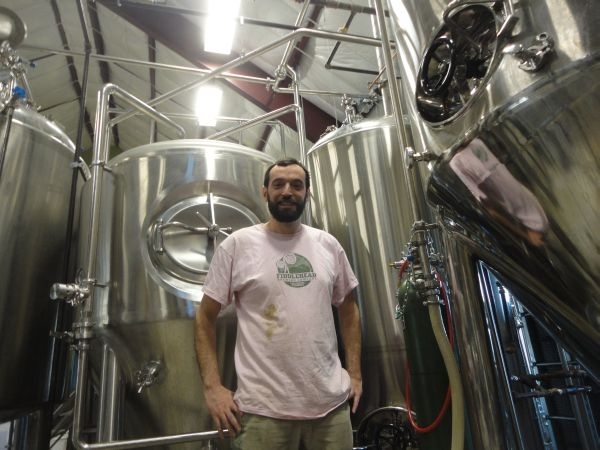 Fiddlehead is one of Vermont’s newest breweries, and this is Cohen’s first try at sap beer, although he’s got a lot of brewing experience. It was part of his college major. "I was an anthropology major and every culture that I studied had some type of fermentable beverage, so I set out in my dorm room to try to recreate these things," Cohen says. Today the barrel in the farmhouse cellar has been replaced by a brewery full of stainless steel equipment. Cohen is making beer with sap from a Monkton sugarmaker, and he says it’ll have a light maple note and won’t be as strong as the traditional brew, so it’s more palatable for modern tastes. He’s calling it Frog Run and it will be available at two upcoming events at Fiddlehead Brewing Company. Cohen isn’t alone. At least one other Vermont brewer makes sap beer. Every May Lawson’s Finest Liquids in Warren markets a strong sap brew that’s aged for an entire year.